West Ham piled more pressure on Jose Mourinho with a 3-1 victory over Manchester United at the London Stadium. Paul Pogba returned after his midweek spat with Mourinho, but it took just five minutes for things to unravel as record signing Felipe Anderson scored his first West Ham goal with a deft near-post flick. A miserable first half for the visitors was compounded two minutes before the break when Andriy Yarmolenko's shot took a wicked deflection off Victor Lindelof to double the Hammers' lead. Marcus Rashford halved the deficit just after the underwhelming Pogba had been substituted on 70 minutes, but Marko Arnautovic extinguished any hopes of a comeback with his fourth goal of the season four minutes later. 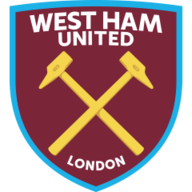 West Ham: Fabianski (8), Zabaleta (8), Balbuena (7), Diop (7), Masuaku (7), Rice (7), Noble (8), Obiang (7), Anderson (8), Yarmolenko (7), Arnautovic (8). Subs: Snodgrass (5), Diangana (n/a), Antonio (n/a). Man Utd: De Gea (5), Young (5), Lindelof (4), Smalling (4), Shaw (5), Matic (5), Fellaini (5), McTominay (5), Pogba (4), Martial (5), Lukaku (5). Subs: Fred (4), Mata (4), Rashford (6). West Ham's first home league victory since the final day of last season lifts them to 12th in the table. Manchester United drop to eighth - eight points off leaders Liverpool having played a game more - after equalling their worst start to a Premier League season. All the talk ahead of kick-off concerned Pogba and Mourinho after a turbulent week off the pitch, but an industrious West Ham display laid Manchester United's on-field troubles bare. Mark Noble's incisive through pass released Pablo Zabaleta, who was marginally offside, in behind Ashley Young, and the full-back's low cross was brilliantly diverted past David de Gea by Anderson inside five minutes. The visitors steadied after falling behind but attempts on goal were sporadic. Anthony Martial headed a Young cross wide from an offside position before a Romelu Lukaku header clipped the outside of the post midway through the first half. Just as had been the case against Everton and Chelsea, a resolute defensive display proved key for West Ham, who doubled their lead with a touch of fortune. 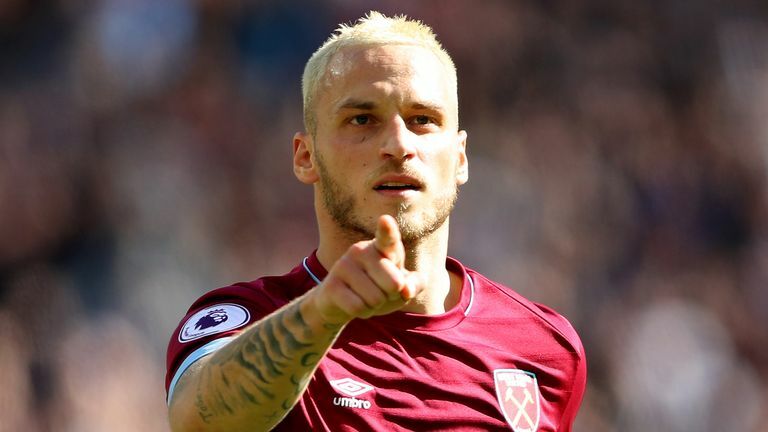 Marko Arnautovic replaced Michail Antonio in West Ham’s only change from their goalless draw with Chelsea. Jose Mourinho made four changes to the Manchester United side that drew with Wolves as Ashley Young, Nemanja Matic, Scott McTominay and Anthony Martial started. Paul Pogba also started despite his midweek spat with his manager. Alexis Sanchez, Jesse Lingard and Antonio Valencia were missing, with Mourinho citing “options” for their absence. Yarmolenko gathered the ball in the area, fashioned a yard of space to get a shot away and his effort struck Lindelof at close range before looping over the helpless De Gea. A stunning point-blank save from Lukasz Fabianski to claw a Marouane Fellaini header off the line preserved West Ham's two-goal lead on 64 minutes. Six minutes later Mourinho withdrew the ineffective Pogba but United were on the board within 60 seconds as substitute Rashford brilliantly diverted a corner beyond Fabianski with a near-post flick. But any momentum gained from that strike lasted just four minutes as Noble's brilliant through ball dissected the Manchester United defence and released Arnautovic, who drilled a low shot past De Gea to wrap up the victory and pile more misery on Mourinho. Manchester United have won just 10 points in the Premier League this season; they last picked up fewer points from their opening seven games of a top-flight campaign in 1989/90 (7). Felipe Anderson is only the second Brazilian to score for West Ham in the Premier League, after Ilan Araujo, who scored four for the club in 2010. Manchester United's David De Gea has kept just one clean sheet in his opening seven Premier League games this season having kept six shut-outs in his first seven last season. Manchester United attacker Marcus Rashford has had a hand in four goals in six Premier League appearances against West Ham (1 goal, 3 assists). In 2018, only Liverpool's Mohamed Salah (24) has been directly involved in more Premier League goals than Marko Arnautovic (17 - 10 goals, 7 assists). Manchester United lined up with four recognised central midfielders - including the returning Pogba - in their team, but it was West Ham's captain who stole the limelight. Noble was the heartbeat of the latest improved Hammers performance but did so much more than leg-work in the middle of the park, as seen with his incisive assist for Arnautovic's game-clinching strike. Things could have been different had Zabaleta been flagged offside in the build-up to West Ham's opening goal. But pinning Manchester United's defeat on that decision would be disingenuous to the Hammers, who were well worth their victory. This game did not hinge on that goal. Manchester United's troubles at present run much deeper than that. West Ham travel to Brighton on Friday Night Football - live on Sky Sports Premier League. 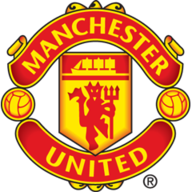 Manchester United resume their Champions League campaign at home to Valencia on Tuesday before hosting Newcastle at Old Trafford at tea-time on Saturday.